Kindle: Amazon's Wireless Reading Device: a convenient, portable reading device with the ability to wirelessly download books, blogs, magazines, and newspapers. 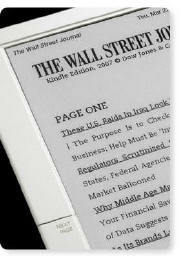 Utilizing a new high-resolution display technology called electronic paper, Kindle provides a crisp black-and-white screen that resembles the appearance and readability of printed paper. The screen works using ink, just like books and newspapers, but displays the ink particles electronically. It reflects light like ordinary paper and uses no backlighting, eliminating the glare associated with other electronic displays. As a result, Kindle can be read as easily in bright sunlight as in your living room. The screen never gets hot so you can comfortably read as long as you like.